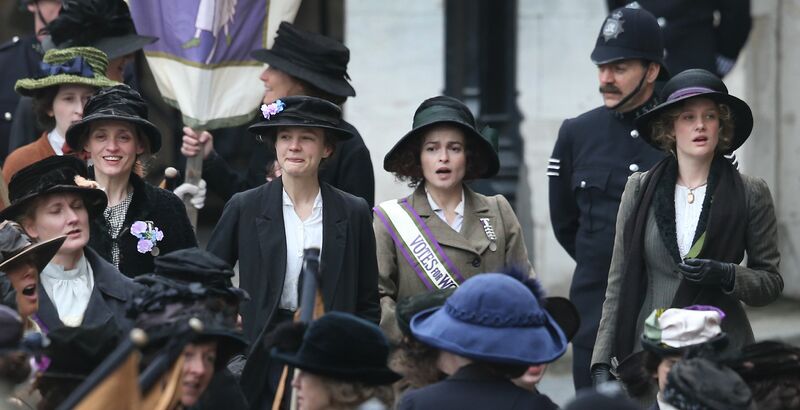 A Look at Suffragette | What Else is on Now? It works on many levels by giving us relatable characters who go through good character arcs and make many sacrifices in the name of earning a right they feel is theirs. It shows the importance of being a proactive part of a growing movement and lets us see what happens when half the world’s population decide that if the powers that be won’t listen to reason, the women will make them listen by any and all means necessary. This is Suffragette. The film begins in London, 1912. Women haven’t had the best of days. As are the commonly accepted beliefs, they aren’t represented in many, if any, facets of society. Instead, they’re represented by their husbands, because that’s fair, right? They have an inadequate work and home balance. But above all else, they don’t have the right to vote. There are few outlets to vent, as of now, but we hear rumblings that a certain Emmeline Pankhurst, who is wanted by the authorities, advocates civil disobedience. Many of the women in the area work at a local factory and are made to scrub, clean, iron- the whole nine yards, minus being in the household. One of the employees is our protagonist, Maud Watts, played by Carey Mulligan. We follow Maud as she heads home, but stops to admire some nice looking dolls in a store. It’s such a calm moment. So let’s ruin it. Another woman nearby, who we’ll meet again in a second, takes some rocks out of her stroller and hurls them through the glass, creating a frenzy as other women also throw rocks. All the while, she shouts out ‘Votes for women’ as she’s subdued. Well, she succeeded in getting everyone’s attention. I’ll give her that much. When Maud returns home, she tells her husband, Sonny, played by Ben Whishaw, what happened while he patches up her hand. Next day at the factory, the man running the ship, Norman Taylor, played by Geoff Bell, berates one of the employees- our rock throwing hero, Violet Miller, played by Anne-Marie Duff. Violet has been late to work one day too many times. Well, it’s not like she’s got obligations at home, including caring for her coworker daughter Maggie, played by Grace Stottor. Violet does share news with Maud about an upcoming hearing at Parliament regarding the vote. Violet plans to attend. Even outside, a woman talks in favor of her fellow ladies getting the right long denied to them. It’s not hard to get that it’s tough for women right now. Sure, they could just play the game and respect the law, but instead of women respecting the law, they argue, how about making the law respectable? A fair argument, I will admit. Back at home, Maud tells Sonny that she plans to accompany Violet to Parliament and discuss their desire for increased wages. Sonny is less than enthused about this. She then takes her son George, played by Adam Michael Dodd, for a checkup at the doctor’s office. The doctor in question is Edith Ellyn, played by Helena Bonham Carter. Looking around the office and seeing the newspaper clippings and articles related to suffrage, Maud figures Edith for a soldier. Rather, Edith may be a suffrage supporter, but as opposed to standing on the sidelines, she’s more interested in actions, not words. As Maud leaves, someone snaps a photo. We cut to an investigation office where a group of men go over the photos of suspected suffragists. Some of these women, like Maud, don’t have to be suffragists, but for the investigators, it’s guilt by association. Leading this investigation is Inspector Arthur Steed, played by Brendan Gleeson. The plan is to arrest the agitators. But Maud is a woman that none of the men have seen before. We return to the factor, where Maud spots Mr. Taylor trying to put the moves on one of the women. She makes a noise to distract him before getting back to work. Soon after, Violet tells Maud that she’s been selected to speak at Parliament. Maud decides to accompany her. But when the day finally comes, Violet arrives with fresh bruises on her face. In light of this, one of the women suggests that Violet back out of her testimony. However, none of the men could identify Violet by her face, so it’s suggested that Maud deliver the testimony. Maud is reluctant, but she eventually relents and decides to speak on Violet’s behalf. Inside, Maud initially prepares to deliver Violet’s words, but she drops the act and tells her story instead. She’s worked at the factory for many years, just as her mother did before her. The work is and always has been hard, and you don’t need schooling for this kind of repetitive manual labor. And in this line of work, as a woman, you’re sure to live a very short life. It also doesn’t help that women earn just 12 schillings to every man’s 19. The men, appearing sympathetic to Maud’s case, ask her what the right to vote would mean to her. Maud is caught off guard by this question, as she honestly never thought of that before. So, the men ask, why is she here? Her response is simple: there has to be another way of living. Indeed, an amendment could help with that. It all sounds promising and Maud even tells Sonny later that David Lloyd George could be supportive. Maud later meets Edith for tea. We learn a bit more about Edith: she’s very much into chemistry and has the educational background to account for her love of it and her job. Her husband, though, inherited his business. Following this, Maud and Violet join a joyous crowd of women awaiting to hear Parliament’s judgment. The members soon arrive for the moment of truth…and they learn that, according to the Prime Minister’s verdict, there is not sufficient enough evidence to support a suffrage bill. As expected, the women are livid. They yell ‘Sham’ and ‘lie’ as the officials retreat. The crowd grows rowdy, so the officers get to work as a riot breaks out. Blood is shed, women are clubbed and fall to the ground, and all hell breaks loose. So Maud is jailed along with other women. One woman is bailed out by her husband and she begs him to bail out the others, but he refuses. Inspector Steed speaks with Maud privately. Maud, of course, is not a suffragette, but that doesn’t mean she can’t see where the other women are coming from. Steed suggests that Maud serve her time and then go home. Maud argues that Parliament promised women the right to vote, but Steed counters that, at the end of the day, Parliament promised nothing and delivered nothing. While Sonny is left to endure taunts by coworkers at the plant and Edith’s store has been vandalized, Maud and the other women serve out their time. It’s here that Maud learns about some of the women who take matters into their own hands. A few refuse to eat and go on hunger strikes, for example. Maud is eventually released and receives a consolation prize: a medal that commemorates her first incarceration. I’m not sure if that’s meant to be endearing or if the women just decided to be dicks, but hey, a medal is a medal. Maud is dropped off at home, where a furious Sonny can’t even bear to look at her. He demands that she never shame him like that again. Right, buddy, you’re the one who is suffering right now. We head back to the factory and Violet has good news for Maud. There will be a gathering on Friday and she will be speaking. Maud later tells Sonny that she’ll be working late as her cover story. At the same time, Steed and the rest of the investigators also learn that a certain someone will be making an appearance very soon. Indeed, Friday night approaches. Tons of women line the streets to hear the voice of their leader. Tensions are high as the officers wait for any opportunity to subdue her. With great fanfare and the support of many women behind her, the speaker and woman of the hour emerges: Emmeline Pankhurst, played by, who else, Meryl Streep. Miss Pankhurst tells her legion that they are in the midst of a battle that has raged for 50 years. Young girls, daughters, mothers, women alike must soldier on in this ongoing clash against the establishment. Words alone will not do. It takes deeds and sacrifices to prove that you’re willing to fight for an equal future for you and your children. The women don’t want to be lawbreakers, but lawmakers. Defy the government and incite rebellion by any and all means, even if it means violence. Well, gird your loins, ladies and gentlemen, because it looks like the women are headed to battle. I don’t think anyone can predict the immediate or how much impact a film will have before its release if it unintentionally ends up coming out alongside a social or political movement. 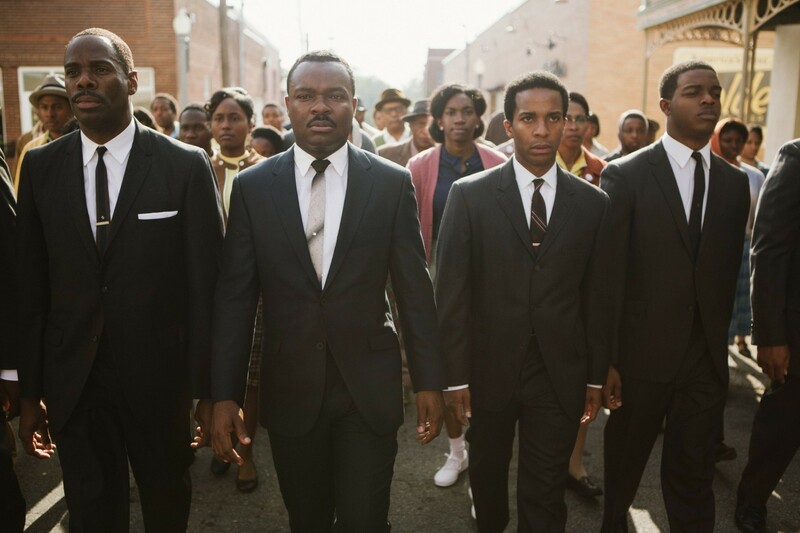 Once it’s in theaters, though, the implications are there and make a film feel even more relevant because it’s telling us a story that we’re living through right now. For example, I think Milk is a well-made and well-acted film. I don’t think Sean Penn should have won over Mickey Rourke for Best Actor, but that’s beside the point. 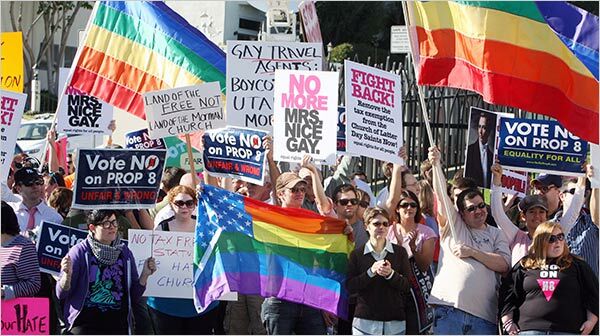 The point is that its release held even more importance and relevance for people in California who were tangled with Proposition 8. 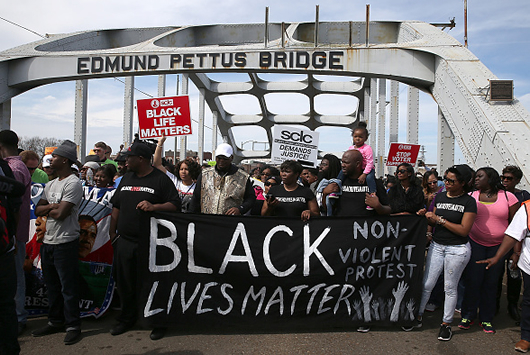 Same goes with 2014’s Selma. Another great film in its own right, but holds more significance with the ongoing ‘Black Lives Matter’ movement and public discussions of racial issues. Films often make us look at ourselves and life around us and wonder just how much or real life is being imitated on the silver screen. At the same time, actors, who somehow wield a great amount of influence, use their experiences both in and out of film to speak out and be advocates on social issues. Not too long ago, someone like Sally Field would be cut off on some networks for speaking out against war. 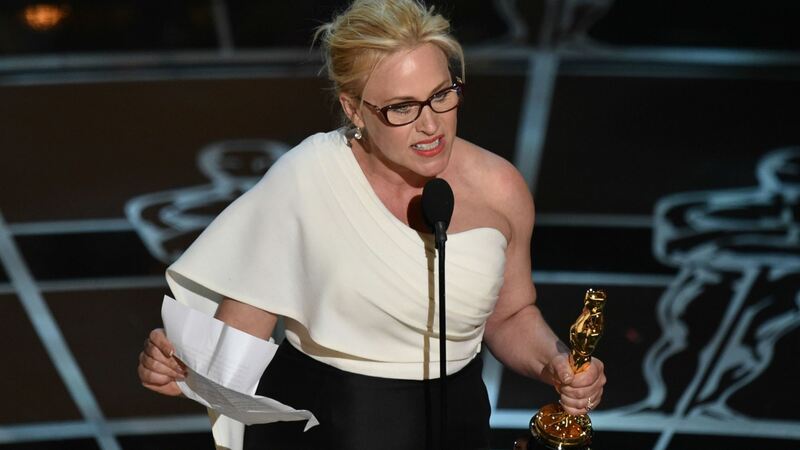 Meanwhile, Patricia Arquette can win an Oscar and, in addition to thanking the Academy, advocate for equal pay between men and women- a conversation that seems to be growing. 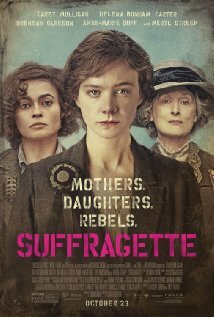 And Suffragette, I feel, holds a bit more prominence because it presents a familiar picture of women fighting for the right to vote. Not even equal rights across the board- just access to the ballot box. This is a story we’re all too familiar with in all cultures: a group that feels denied its basic right to something takes to the streets and advocates for change. Now I’m just one heartless cynic, but I’m of the belief that we’ll never get to a time where there will be 100 percent equality across all creeds, colors, or groups in general. There will always be someone that strives to be the alpha. I think back to a line from the film Ghosts of Mississippi, where one character remarked that America, for instance, may be legally integrated, but emotionally, the people would always be segregated. I tend to agree. The very ideas and concepts that make us focus on our differences instead of our similarities still run deep in many facets of life. The struggle to overcome them is not and may never be over. You may think I sound pessimistic, and you’re right, though I prefer realistic. What I’m saying is that the battle for one right doesn’t equate to acceptance from your peers. That’s just reaching one tier while preparing to top the next. 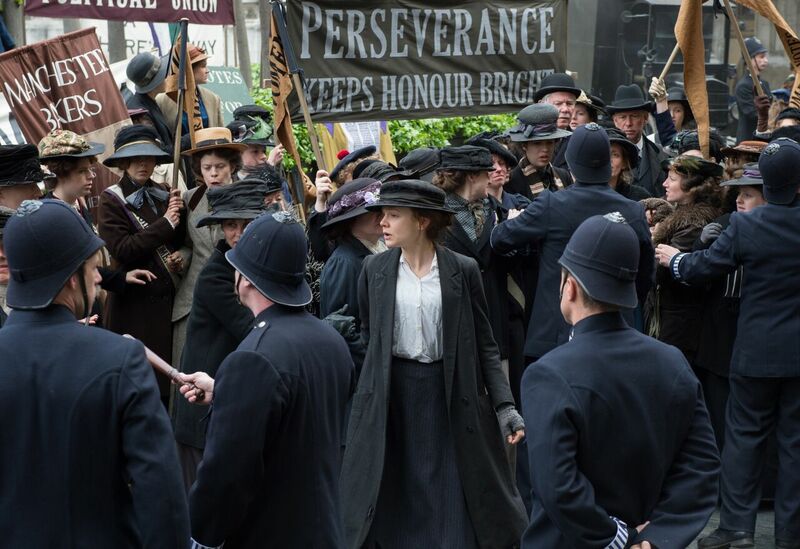 Much like Selma, Suffragette has the advantage of telling a focused story. This isn’t about the global suffrage movement and it doesn’t try to put this story in a larger context. It’s about a group of women in London who just wanted more from life. People can become too complacent in their lot if they feel that they’re getting along just fine. If you have a modest living, then sure, you may not live the life of the rich and famous, but there’s no reason to be disappointed with what you have. To some, the idea of bettering yourself may not even occur to you if there’s no need or desire. When you have social movements like this, you’re bound to have two types: the ones who want to push for change, no matter what the consequences, and those who would prefer to be cautious. It’s similar to the final point made in the last debate of The Great Debaters: an unjust law is no law at all. How is a person to resist? With violence or civil disobedience? For some, like Maud, the idea of gaining the right to vote never occurred to them because they saw nothing wrong with how they lived, even if they were second class citizens. However, as more tend to speak out, you become aware of the disadvantages you face and that pushes you to action. But the execution is the challenge. How do you change minds and hearts? Through simple protest and possibly becoming a martyr, or trying to work within the system? Suffragette gives us women who, at first, don’t necessarily seek the right to vote, but would like their ideas and voices to be heard. And as Maud mentions, war is a language people understand. 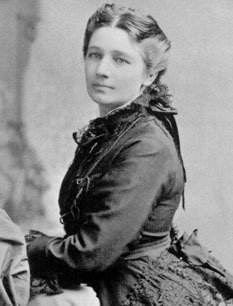 I think back to Victoria Woodhull, first female candidate for President, way back in 1872. Despite the fact that women would not have the right to vote for almost another 40-50 years, in some countries, she took a risk that she knew could earn her scrutiny not just from men, but women who thought she took her actions too far. The same could be said for some of the women in Suffragette who are just bystanders. Sure, they might want better lives, but they aren’t willing to upset the established order. Maud is one of those women, and not just because she’s a fictional character in a universe filled with some actual, real-life figures. She represents the common woman who accepts that she makes and is treated less than a man, but endures this treatment because it’s all she knows. As evidenced by her testimony to Parliament- probably one of my favorite scenes, the more I think about it- she never considered more because it never occurred to her. But despite that, she acknowledges that there are better ways to live beyond her current situation. What unites the women as a whole is their common cause to be seen as equals with their male counterparts. Maud even points out to Inspector Steed that women make up half the world’s population, so they can’t all be silenced. At the same time, many of the women are content aren’t willing to drop everything, give up their families, children, or jeopardize their lives for a basic right. Again, there are those who don’t want to become militant because they feel that they’ve too much to lose. Work within the system, obey the law, keep your head down, always respond in the affirmative, do what your superiors demand, and always keep on a happy face. Do all of those things and the establishment will notice and reward your diligence. At least, that’s what some hope. But if you’re not a lawmaker or someone who enforces the rules, all you can do is dream. So when the government or higher-ups in society don’t or won’t meet you halfway after you’ve appeased them, what option is there but violent activism? The women humble themselves, don’t cause a fuss, and make a rational case as to why they should have the right to vote, but their efforts prove fruitless. In that case, as Pankhurst tells her followers, words alone won’t do. You have to shake up the way things are and force people to pay attention to you, no matter the cost. It’s a tactic we’ve seen employed by protesters many times, even today, whether in regards to voting rights, worker’s rights- if you fight back with force against an oppressive regime, you’re sometimes seen as uncontrollable, radical, savage, and every other negative association that would make your effort all for naught. But if you’re mostly nonviolent, then you garner sympathy from those who don’t like seeing people assaulted. And while I don’t endorse tactics like shattering windows or blowing up homes as a means to get a point across, I do understand the frustration of wanting something you feel is yours by right. Breaking the law is still a crime, but for some, including the women, that’s the best way to get your cause some attention. Dramatic action does tend to do a better job of shaking people out of apathy. Suffragette may have a dreary look that mirrors the complacent mindset of some women at the time, but that makes the more violent scenes stand out when they happen. There’s not a ton of violence in this film. In fact, I think I can count the number of intense confrontations with law enforcement on one hand. It’s not just violence for the sake of violence. It’s showing that the women are ready to put everything on the line and more to make a point. I can tell already that some people aren’t going to be comfortable with seeing scenes of women being beaten by police. There’s even an instance of a character being force-fed after going on a self-imposed hunger strike. That scene alone was uncomfortable, but I see this making people angry. Hell, when watching this in the cinema, there was a woman in the row behind me that kept kicking the seat in front of her out of anger. The audience experience here was very similar to that of The Hunting Ground. Though Suffragette tells the story of one battle in a long, ongoing struggle that women face to this day, I do think the film does a good job at making these characters feel sympathetic. These aren’t antagonistic women- they’re just fed up with the way things are and want something different, even when they know it will be an uphill battle. And it doesn’t help that the women realize that they have just as much to gain as they have to lose. Even being seen as a supporter opens them up to criticism and harassment from male coworkers, superiors, and their husbands. Not to mention so much time devoted to helping the movement means less time helping yourself and being there for your family, as Maud learns the hard way, but I won’t spoil that entire plot. While all of the women of Suffragette may not be on board with the more extremist tactics, they at least appear open to the concept of more rights and how they can make a better life for themselves. If you’re stuck in your ways and don’t have a problem, there’d be no need to consider supporting a movement other than through your words, but words aren’t enough. 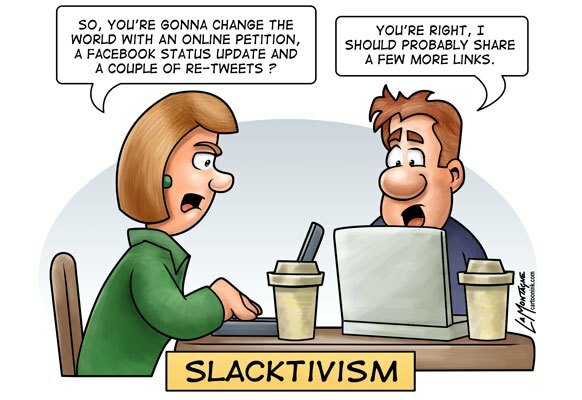 This is my problem with what we call armchair activism today. People announce their support and solidarity for some sort of tragedy, but their backing dwindles down to nothing than a hashtag or a photo filter change. Hell, we have this going on right now with the Paris situation, but consider- marriage equality, Bring Back Our Girls, Kony, there have been many instances of people considering themselves part of a bigger movement without actually doing anything. It’s like wanting the smug satisfaction of thinking that your few clicks make a difference when they don’t. But that’s another story. If the women in London just said they would back Pankhurst’s efforts, but didn’t do anything, they’d be just as ineffective as our keyboard justice warriors of today: all talk and no action. 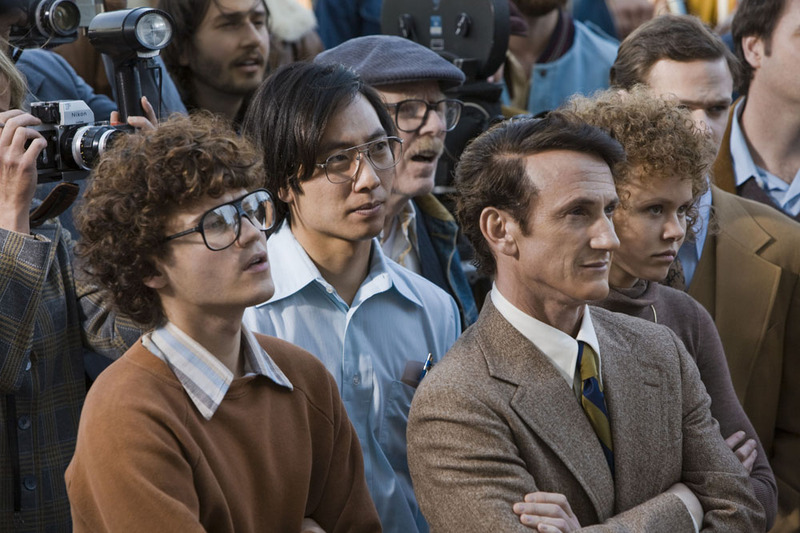 The film doesn’t take a lot of time to stop and discuss the implications of the protesters committing violent acts, which is a bit of a letdown, if only so there could be more potential conflict within the group. Even if the women want more in life, they’re not all going to agree on the proper tactics. I just wish the movie explored that avenue a bit more. Also, I do wish that there was more inner conflict among the women, though. There are glimpses of it when some remark that Pankhurst asks too much and I wish we had more of that. At the end of the day, these women are being asked to do things that endanger their personal lives, so it would have been nice for the film to explore this avenue. Maud, as someone who happens to be in the right place when pivotal things happen, at least gets a decent amount of development when it comes to her feelings on suffrage. Though she could have easily been based on a real figure, I’m not completely against having a fish out of water character because we get to learn and understand the journey along with them. She’s open to discussing suffrage at first and hopes that Parliament will come through, but when that doesn’t happen, she realizes that the militant efforts made by other women have a point: make some noise and get people’s attention. You have a better job that way than by gathering to hear speeches. She sacrifices a lot in the process: her health, her relationship with her husband and son, her very name is associated with other women viewed as radicals, and she’s putting her very life on the line. Again, going back to the Parliament, she realizes that there has to be a better way to live than how she does now. As she’s proven many times before, and even earlier this year with Far From the Madding Crowd, Carey Mulligan is excellent at expressing a range of emotions. I felt the loss on her face when she slowly realized she couldn’t spend as much time with her son, or her sudden anger after Parliament let her down by not approving suffrage. Though she’s not the bomb thrower some of the more militant women are, the film takes time to show her natural progression to going from bystander to outspoken suffragist. I don’t know how Meryl Streep ended up having so much prominence in the trailers and promotions for this film, given how she’s not in it very long. She’s fine as Pankhurst, but it does feel like a cameo. This could have been anyone, but it seems like having Streep play the role gives it more weight. But if you’re going to have a big name actress like Meryl Streep in a role, do more with her. If you’re not, don’t make it seem like she has a bigger role than she really does. If I had a minor qualm, it’s that the film goes into real life footage and on-screen descriptions of what happened later in history, as if to sum up the future for the audience that may already know this. Pawn Sacrifice did something similar and I wasn’t a fan of that, either. If the events of your film are done, I don’t think it’s necessary to spell out what happens later. I also don’t think this film needed to rely on archival footage at one point when we were pretty much getting those events on-screen already. This is really minor and not even an issue, but it’s something I can’t help but notice with some films. Suffragette is a very strong film. Though not all of its characters are as fleshed out as Maud, the movie makes their struggle and anger feel believable as it reminds us of how far we’ve come since then. And, as some would say, how much further need to go for certain rights. It doesn’t feel preachy and takes time to show the benefits and dangers of what comes when you stand up for what you feel you deserve. 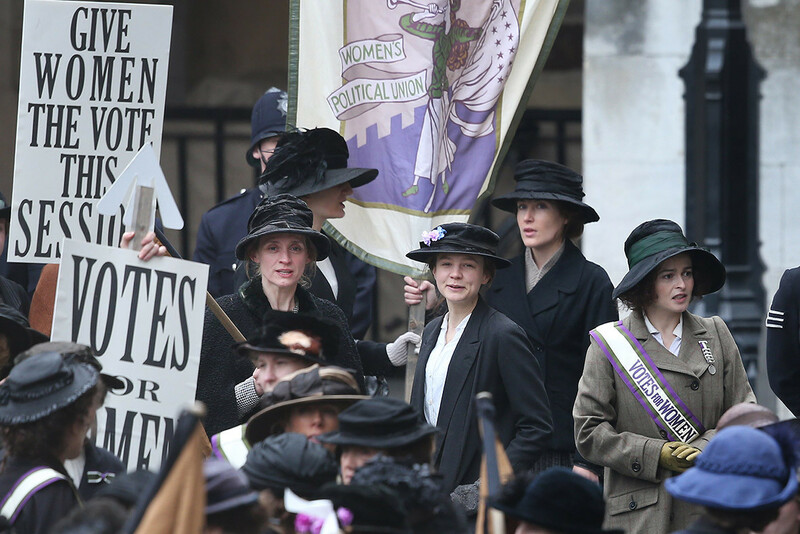 It’s backed by strong performances from Anne-Marie Duff, Helena Bonham Carter, and especially Carey Mulligan as they take us to a time where women were willing to put all they had on the line to get access to the ballot box. On its own merits and release date, the film is impressive, but it’s sure to hold more importance when we’re talking about the pay wage gap. It shows how far we’ve come as a world, but there’s more to be done. This entry was posted in Film and tagged Abi Morgan, Activism, Adam Michael Dodd, Adrian Schiller, Amanda Lawrence, Anne-Marie Duff, Arthur Steed, Ben Whishaw, Brendan Gleeson, Carey Mulligan, David Lloyd George, Edith Ellyn, Emily Wilding Davison, Finbar Lynch, Geoff Bell, George Watts, Grace Stottor, Helena Bonham Carter, Maggie Miller, Maud Watts, Meryl Streep, Natalie Press, Norman Taylor, Sarah Gavron, Sonny Watts, suffrage, Violet Miller, voting rights, Women's rights by omarid513. Bookmark the permalink.